The open secret being hidden from the world in the past half century is that the entire proceedings of the Aburi Conference of January 1967 were tape recorded and made available to both sides in the Nigeria crises. The host as well as the chief broker of the now infamous Aburi Accord, General Joseph Arthur Ankrah of Ghana, did not only provide the appropriate milieu for the military leadership delegations from Lagos and Enugu to meet face-to-face but also worked very hard to ensure that an implementable outcome was arrived at after all was said and done. The entire deliberations were audio-recorded and tapes were reproduced and given to each party before departing Accra, Ghana. The tragedy of it all is that Africa’s most brutal warfare broke out in Nigeria barely six months after the Aburi Accord was supposedly reached after days of intense dialogue and consensus building by the two disputing parties. The Civil War lasted 30 months and consumed more than 2 million people, mostly on the Biafran side – comprising children, women, the sick and aged in the populace. Looking back, it appeared that Gowon had tried to blame Ojukwu for not allowing Lagos to make a broadcast of the conference’s outcome first before any remarks from Enugu. Could that flimsy excuse then justify the jettisoning of such an important agreement brokered by the Ghanaian head of state and the preference for a military option by the Gowon-led Lagos junta? This is a question that historians ought to be answering today. But Nigeria has no historians because History subject was effectively banned by the federal government in Lagos, and now in Abuja. Equally important is the actual role played by the Lagos-based diplomat(s) to which Ojukwu had alluded in the YouTube video. It is now well known that the British diplomats worked overtime in directly guiding the Lagos ruling military junta since the bloody counter coup of July 29, 1966. It was the British, for example, who actively intervened so as to turn the counter-coup plotters away from their slogan of “ARABA” (Hausa term for secession) into spilling the blood of millions in order to “keep Nigeria one”. Of course, Prime Minister Harold Wilson’s government of Great Britain literally oversaw the execution of the Civil War and was the main provider of the logistics for weaponry and hard cash needed to rapidly expand the Nigerian army within a very short period of time. British diplomatic umbrella was also effectively used to shield the Lagos junta from scathing international opprobrium for its genocidal escapades during the war while blocking the secessionist Biafran government from obtaining the much-needed recognition by other nations worldwide. But how can the present and future generations of Nigerians ever know anything about the Civil War that ended up turning their nation on its head if History subject cannot even be taught in the country’s school curriculum? 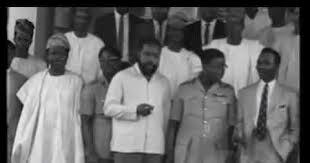 The audio recording of the Aburi Accord is available as revealed by Ojukwu in this YouTube interview. But who actually is interested to replicate and mass distribute this important historical document for benefit of the Nigerian masses? Who neglect one’s own history, the saying goes, are destined to repeat it. Nigeria, it would appear, cannot escape this truism.